Growers need to consider potential disease carryover into the 2019 season if wet conditions are experienced during summer resulting in weed and crop regrowth. The use of drone imagery is enhancing grains research in Western Australia, providing unique close-up aerial observations of crop growth and performance to aid field trial evaluations. Grain growers with compacted sandy soils could achieve yield improvements of more than 35% by using topsoil slotting plates in association with deeper ripping, according to recent research. There are several ways growers can minimise snail contamination in crops by planning to harvest when snails are not active or by baiting or burning after harvest. Volunteer wheat can become a ‘green bridge’ leading to increased risk of crop disease. This vegetation can serve as a ‘green bridge’ for diseases and pests which need a living plant to survive, such as cereal rusts and powdery mildew, root diseases and aphids. If weeds and/or volunteers are present at the start of the new cropping season, particularly in or adjacent to cropping paddocks, there is a greater risk of early spread of pests, viruses and diseases to newly emerging crops. Rust spores are wind dispersed and can easily spread from one end of the Wheatbelt to the other. This year, wheat leaf rust and powdery mildew were prevalent near Esperance and barley leaf rust was found on the south coast. If there is a wet summer and autumn in 2019 then inoculum of these diseases may be carried into the new cropping season. To minimise this risk, growers are encouraged to monitor any green bridge for disease so that timely action can be taken to identify the pathogen, and limit the spread and build-up of inoculum. It is crucial that growers kill weeds and crop volunteers, including those along fencelines, prior to the start of the cropping program to reduce potential pest and disease outbreaks. Ideally there needs to be a break (a fallow period) of at least two weeks free of vegetation capable of hosting disease or pests prior to sowing. To achieve this, the weeds and volunteers should be sprayed with a herbicide at least four to six weeks before sowing, to ensure weeds are completely dead at planting. Alternatives to herbicides are to heavily graze or cultivate weeds and crop volunteers which will reduce their potential as a ‘green bridge’ or host of diseases and pests. sow clean seed. Use certified seed treated with seed dressing fungicide that provides protection from at least smuts and bunts. know the latest disease ratings of your varieties and plan accordingly. Use adult plant resistant varieties. Crop variety guides are available for all grains on the Department of Primary Industries and Regional Development (DPIRD) website, which detail the disease susceptibility for each variety. consider applying in-furrow or seed dressing fungicides to reduce your risk of early infection of diseases such as rusts, net blotches and powdery mildew in susceptible varieties, and rhizoctonia, crown rot and take-all. For more information see DPIRD's Seed dressing and in-furrow fungicides for cereals in Western Australia. in case of early disease outbreak, budget for early foliar fungicide sprays where upfront fungicides are not used. For more information visit DPIRD's Registered foliar fungicides for cereals in Western Australia. reduce exposure to stubble borne diseases through rotation and careful paddock planning (to avoid sowing on or adjacent to infected stubble) or stubble management (such as grazing, windrowing, baling, incorporating or burning). earlier sown crops may be more at risk of some foliar diseases such as powdery mildew, net blotches of barley, septoria and yellow spot of wheat so consider later sowing of susceptible varieties and at risk paddocks, or at least plan to monitor earliest sown paddocks closely for disease. For more information see DPIRD's Control of green bridge for pest and disease management and the Grains Research and Development Corporation's (GRDC) Green Bridge fact sheet. Sclerotinia stem rot in lupins is caused by the same fungus (Sclerotinia sclerotiorum) that infects canola and both were found across the Wheatbelt in 2018. Sclerotinia can also infect most broad leaf crop and pasture species but not cereals. So cereals can be used as a break crop for the disease. The disease inoculum, sclerotia, that are not harvested with seed, can survive for up to six years in soil and stubble. Growers are advised to carefully consider paddock rotations and use clean lupin and canola seed in 2019. For further disease forecasts and information on managing specific diseases in 2018 see the department's Crop diseases: forecasts and management. For more information on crop diseases contact Kithsiri Jayasena, Plant Pathologist, Albany on +61 (0)8 9892 8477, Geoff Thomas, Plant Pathologist, South Perth on +61 (0)8 9368 3262 or Andrea Hills, Plant Pathologist, Esperance on +61 (0)8 9083 1144, Ravjit Khangura, Plant Pathologist on +61 (0)8 9368 3374 or Ciara Beard, Plant Pathologist, Geraldton on +61 (0)8 9956 8504. For more information on crop viruses contact Brenda Coutts, Virologist, South Perth on +61 (0)8 9368 3266. DPIRD is using drones fitted with high resolution and multi-spectral cameras to enhance assessments of grains field trials, boosting the accuracy and integrity of research findings. Picture provided by Stratus Imaging. The Department of Primary Industries and Regional Development has been using drones fitted with both high-tech and multi-spectral cameras over the past two seasons in grainbelt trials. Research officer Glenn McDonald first used the drones in 2017 in a soil water repellence agronomy trial at Kojonup to measure ground cover to determine the level of crop establishment. The drones proved to be a useful tool to obtain reliable measurements on responses to treatments across the field plots. Plant emergence can be delayed by up to four months in water repellent soils, resulting in widespread crop variability, which can be difficult and time consuming to monitor across a plot without causing plant damage. Drones were flown every three weeks, targeting areas where different treatments had been applied. The regular collection of high resolution drone imagery data was particularly valuable in observing plant changes in response to treatments, environmental stresses and plant health, as well as collecting information on flowering density. 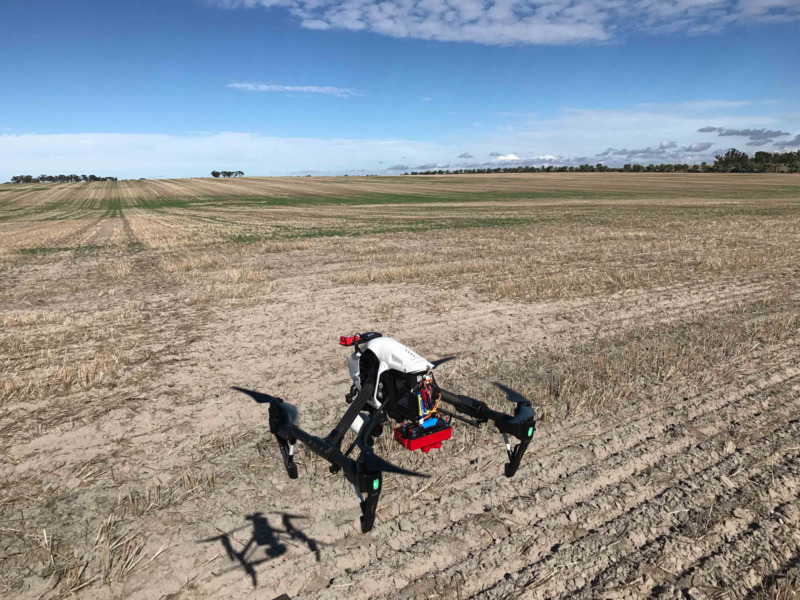 While the use of drones in grains research is still in its infancy, Mr McDonald said the equipment would provide greater confidence in the accuracy and integrity of research data when used alongside traditional scientific assessments. The data collected by drone imagery helps to give us a better understanding of crop establishment and crop vigour responses to various soil water repellence treatments. This information complemented the physical measurements and observations made during the season to strengthen the trial results and conclusions. The drones have been used during the 2018 season to collect targeted data on treatment responses at more than eight soil research trials across the Great Southern. The department continues to explore the use of drones to improve research and efficiencies across the organisation. DPIRD research officer Wayne Parker assesses root development in a red non-cracking sodic clay, three years after it was deep ripped with topsoil inclusion, as part of a research project to investigate the use of topsoil slotting plates. The Department of Primary Industries and Regional Development’s (DPIRD) field trials, with co-investment from the Grains Research and Development Corporation (GRDC), showed topsoil slotting plates provided an additional boost to large yield increases produced by deep ripping. Topsoil slotting is thought to enhance and prolong the effect of deep ripping, when combined with controlled traffic farming, enabling plant roots to penetrate into the clay. There has been increasing interest from growers in the use of topsoil slotting plates; however, questions remain regarding the benefits relative to the additional cost. The department’s trials used topsoil slotting plates, 28cm long and 43.5cm deep, bolted behind ripping tines and working 100mm below the soil surface, allowing topsoil to fall down into the ripping slot. Department research officer Wayne Parker said three years of trials at Moora and Binnu showed a significant yield response in the first two years from deep ripping at 550mm with topsoil slotting plates. The results varied depending on crop type and seasonal conditions. Topsoil slotting provided a positive response at both sites in 2015, allowing plant roots to access moisture at depth during a hot spring, resulting in an 83% yield increase in canola at Moora and an 18% yield improvement in wheat at Binnu. In 2016 there was a 33% increase in barley yields at Moora, while at Binnu the increased lupin biomass generated by deep ripping ended up producing excess shade that limited yield improvement to 9%. In 2017 the yields in the northern trial were compromised by the late start to the season, low rainfall and hail damage, resulting in a negative response in wheat at Binnu, however, there was a 54% increase in lupins at Moora. The department is preparing to harvest the final year of these trials, while complementary trials on different soil types will continue in Ravensthorpe and Salmon Gums. While topsoil slotting plates had a role to play when ameliorating soil compaction, their use would have to be considered carefully alongside the cost of the application. In addition to the cost of the plates, the extra drag adds 20% to the energy cost of towing the ripper, not to mention the extra wear and tear on machinery. It is also important to note that soil compaction is only one of the soil constraints present in sandy soils. Subsoil acidity and soil water repellence continue to be costly constraints, which are not remedied by deep ripping. To get the most from the increased cost of plates, it is better to have the topsoil pH amended prior to slotting to assist subsoil pH amelioration. More information about the department’s soil management research is available on the website. Small pointed snails in canola grain. If snails are present in a crop at harvest time the only way growers can avoid contaminating the grain, is to harvest when snails are low in the crop canopy and not in the grain heads. Research, as part of the Boosting Grains Research and Development program, has found that snails actively move from 6pm at night and during cooler, overcast weather. During these times snails are more likely to climb up the stem of a plant to the head. The best time to harvest to avoid snails in grain is from 11am to 6pm. During this time snails were found not to move and higher numbers were located under stubble. It can be difficult to remove snails once they are present in grain, especially if the snails are the same size as the grain. Small scale trials have shown that drying the grain in a grain dryer will not kill snails. Small pointed snail on canola about to be harvested. After harvest there are options for snail control. Windrow burning can be effective. In 2015 Department of Primary Industries and Regional Development (DPIRD) trials, initiated by the Grain and Research Development Corporation’s (GRDC) Albany Regional Cropping Solutions Networks (RCSN) group, found that burning the windrow led to a significant reduction in snail populations. In a windrowed canola paddock with standing stubble next to the windrows, the highest proportion of snails was in the windrow - at more than 200 per square metre. Baiting after harvest is possible to kill snails but needs to be done only if snails are actively feeding. Snails will move during summer if there is sufficient moisture but this does not mean the snails are actively feeding. Small conical snails and round snails won’t lay eggs until Autumn. 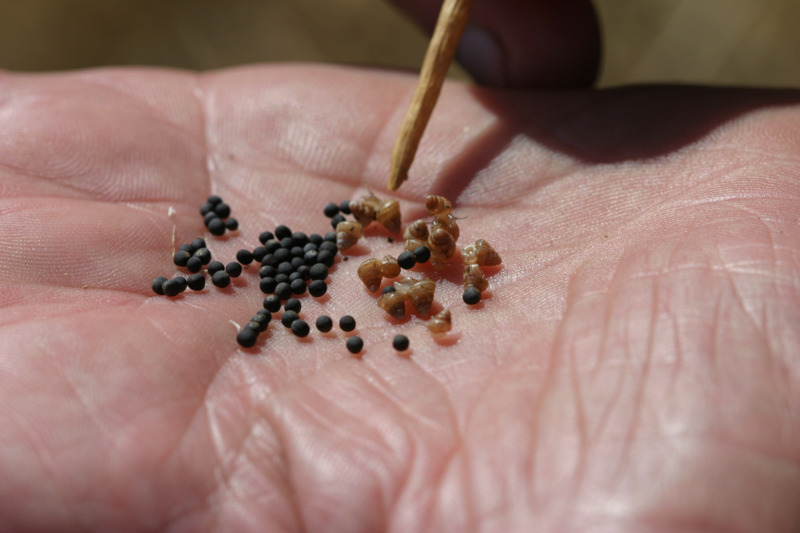 Place a small amount of baits to determine if snails are actively feeding before baiting an entire paddock. Trials funded by GRDC,in conjunction with the Stirlings to Coast Farmers, found that if baits are evenly spread, small conical snails are more likely to encounter them. Getting an even bait spread can be difficult. SnapBait, an app produced with funding from Boosting Grains Research and Development program, has been designed to assist with bait spreader calibrations. The app detects blue or green baits on an even background such as gravel, bitumen, concrete or level bare ground onto which the baits should be spread for calibration purposes. The app will then give an estimate density of baits per square metre. A standard size card (e.g. credit card) is required to be placed within the photo for the phone to have a reference of the bait size. This will give spread per square metre. DPIRD recommends taking more than one photograph along a transect. Each photo and result may be saved with date, time, GPS coordinates and you can label or add notes to each result. For more information contact Svetlana Micic, research officer, Albany on +61 (0)8 9892 8591.